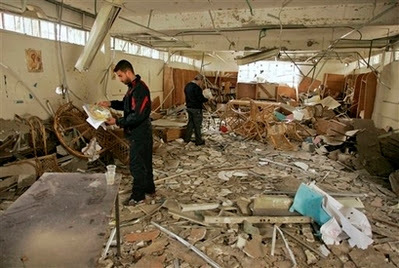 The Gaza Young Mens Christian Association (YMCA) building was blown up last Friday. Sources blamed the reprinting of the Danish Mohammad cartoons for the reason behind the attack. Here with an item from last week’s news that you might not have heard about: Unidentified gunmen blew up the YMCA library in the Gaza Strip on Friday morning. While no one was hurt, two guards were temporarily kidnapped while the offices were looted, a vehicle stolen and all 8,000 books destroyed. No one has claimed responsibility for the attack, although Fatah accused Hamas of being behind it. Hamas, for its part, strongly denied any responsibility and condemned the attack. Meanwhile, confidential sources in Gaza told the Jerusalem Post that the attack was in response to the reprinting of the Muhammad cartoons in Danish newspapers last week. The supposed motivation for the attack, and the fact that it was not big news, illustrates the dire situation faced by many Christians living in the Palestinian territories. There are only some 3,500 Christians, mostly Greek Orthodox, in Gaza. Over the past two years, al-Qaeda-affiliated groups have claimed responsibility for attacks against Christian figures and institutions with the stated goal of driving Christians out of Gaza. Meanwhile in Denmark… The 9 days of immigrant rioting continued and a bomb went off in Copenhagen.